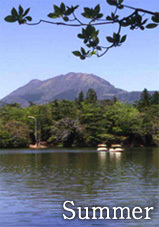 The “3 peaks and 5 mountains of Unzendake” is the collective term for the 8 mountains, Mt, Fugendake, Mt. 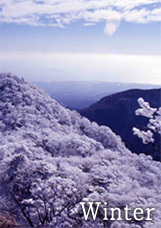 Myokendake, Mt, Kunimidake, Mt. Kinugasa, Mt. Takaiwa, Mt. Nodake, Mt. Yadake, and Mt. Kusenbudake. There is plenty of nature at Unzen. In 1927, Unzen came in first place in the mountain category for the New Eight Views of Japan, and was designated as our country's first national park in 1934.Unzen's nature has been preciously preserved since days of old, and is an encyclopedia of nature. It is a treasure trove of wild birds and highland plants. 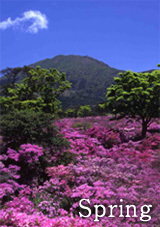 In spring, Unzen azaleas turn the mountainside pink, and when the fresh, young leaves turn to early summer green leaves, they herald the arrival of summer. 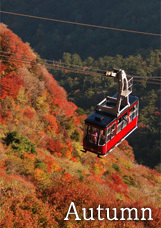 When the entire mountain becomes red and orange, autumn and fall leaves have arrived, and come winter, the trees become crystallized with hard rime. The Unzen Jigoku was the stage for Christian martyrdom. There are around 30 Jigoku's, such as Daikyokan, Oito, and Seishichi, each billowing with steam from the fumaroles. The Unzen hot springs has been popular as a summer retreat open to foreigners since the Meiji era as an international tourist spot. 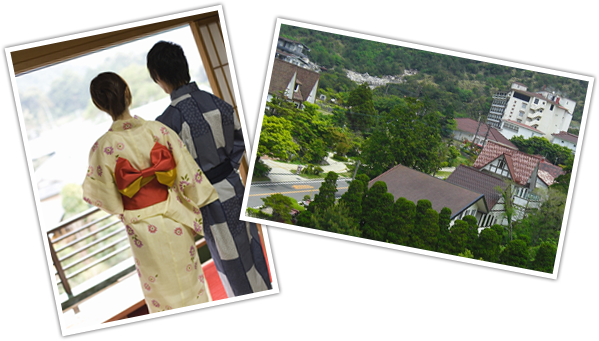 The hot springs town is divided into 3 sections: Furuyu, Shinyu, and Kojigoku. The inn district, seemingly continuing on, is engulfed in the steam billowing from the Unzen Jigoku.